Halloweenies is a fun online video slot machine game released in November 2005 and it is offered exclusively at online casinos powered by Microgaming. This online video slot game has 5 reels and 20 pay lines. The theme of Halloweenies is inspired by the night that is October 31, the only time in the year to do typical festive Halloween activities such as trick-or-treating, carving pumpkins into jack-o’-lanterns, costume parties, lighting bonfires, watching horror films, playing scary pranks, telling scary stories, visiting haunted attractions, and eating Halloween foods (candy corn, candy pumpkins, caramel apples, caramel corn, pumpkins, roasted sweet corn, soul cakes and scary-faced pizzas). Scary yet comical monsters are waiting for you to join them on their trick-or-treating trip around the neighborhood this Hallow’s Eve at the Halloweenies online slot game! Don’t mind getting lost in the forest, stumbling at a graveyard, and going inside an abandoned house as long as you are with your friends who are dressed up as cute ghoulish monsters! You get to eat all the candy you want too while you try to win nice payouts in the Halloweenies online slots! How’s 13,000 coins sound? Microgaming online slot games are available to players in 2 formats – download and no-download. Whether you like to download their software first or you prefer to play instantly without the need to download, then Microgaming surely has online slot machine games to accommodate your every slot gaming preference. Halloweenies is available for instant play, so you do not have to download anything first to find out if this game interests you enough in a way that you would like to spend some real money on it. Are you the type of person that likes Halloween but gets easily scared? You would surely like playing Halloweenies as this online slot game presents scary but comical characters that will make you laugh rather than make you scream! If you are someone who enjoys watching the cartoon “The Grimm Adventures of Billy and Mandy” and/or you like to dress up as a monster during Halloween, then Halloweenies will surely entertain you! The Halloweenies online video slot game features scatter wins, a wild symbol, 2 fun Bonus Feature games (Free Spin Bonus Feature game and a Pick a Pumpkin Bonus Feature game),a maximum coin jackpot of 13,000, and a maximum cash jackpot of $32,500! The quality of the graphics and sounds that Microgaming provides is extremely brilliant and superb. They have a solid reputation of making the most stunning graphics and awesome sound effects that will truly transport you to “that specific theme” they used in any of their slot games. Most people love to play games run by Microgaming software because they have smooth animation and engaging yet non-interfering sounds. In Halloweenies, players are left to their own devices to imagine where they are, based on the many creepy sounds they hear while playing this particular slot game. Are you lost in the forest, at the graveyard, or at an abandoned house? Many online slot players love the chill factor of the Halloweenies online slot game as it builds anticipation for forming winning combinations and triggering those two generous Bonus Feature games! All symbols are simply animated when they are included in winning combinations, and you will definitely not strain your eyes when you play this game for a long time as the symbols are colored brightly and appropriately. 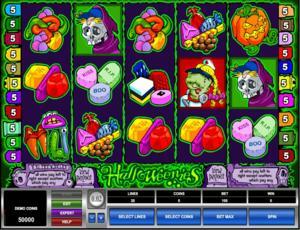 The overall graphic design of Halloweenies displays mostly the color green and purple. Other colors used are blue, red, pink, white, black and yellow. The howling wind, singing crickets, the creepy sounds of bats, the sound of footsteps and closing doors are the constant background sound effects you will hear in the Halloweenies online slot game. When you spin the reels, you will hear a hammering sound whenever each of the reels stop. A booing, tinkling sound, and a hearty laugh will be heard when the wild symbol is involved in a winning combination. All in all, the background music and sound effects perfectly match the theme of the game, and will surely make your hairs stand up if you’re the type who gets easily startled! There are no card deck symbols available in the Halloweenies online video slot game. The symbols that you will find in Halloweenies are: the Werewolf, Witch, Frankenstein, Skeleton, chocolate and candy, licorice candy, jelly candy, gum candy and hard candy. The Wild Symbol is the Halloweenies Wild symbol. It acts as a substitute for all other symbols (except for the scatter symbols) in order to help you complete a winning combination. You are paid varying bonus prizes (see payout table) when you form winning combinations with multiple Halloweenies Wild symbols on an active pay line. There are 2 Scatter Symbols in the Halloweenies online slot game: the Pumpkin and the Bunny symbols. These scatter symbols are not required to appear in a line (on an enabled pay line) for you to win. • Pumpkin scatter symbol – Appears in any position on the reels. When you get 3 or more Pumpkin scatter symbols anywhere on the reels, you will trigger the Pick a Pumpkin Bonus Feature game. • Bunny scatter symbol – Appears in any position on the reels. When you get 3 or more Bunny scatter symbols anywhere on the reels, you will trigger the Free Spin Bonus Feature game. Your winnings are calculated by multiplying the Pumpkin and/or Bunny scatter symbol combination payout (refer to the Payout table) by the total number of coins you’ve bet. Please take note that if you get a scatter win and a regular win, then you are paid out for both of these wins, because the Pumpkin and/or Bunny scatter symbol is not required to come out on an enabled pay line for you to win. Scatter awards are independent from pay line awards; therefore, they are added to the pay line win. If you get 3 or more Bunny scatter symbols found anywhere on the 5 reels, you will trigger the Free Spin Bonus Feature game. You will be rewarded 13 Free Spins, and all of the winning combinations you form during the Free Spins will be generously tripled! If you manage to get another 3 or more Bunny scatter symbols (anywhere on the reels) while playing the Free Spin games, you will win another set of 13 Free Spins! The additional Free Spins are included to your remaining number of Free Spins. You can win an infinite number of additional Free Spins while playing the Free Spin Bonus Feature game. You can also activate the Pick a Pumpkin Bonus Feature game while playing the Free Spins; however, the Free Spin multiplier will not multiply the winnings you’ve won during the Pick a Pumpkin Bonus Feature game. Please take note that since the Bunny is a scatter symbol, your winnings are calculated by multiplying the Bunny scatter symbols combination payout (refer to payout table) by the total number of coins you’ve bet. When the Free Spin Bonus Feature game is over, you will be then taken back to the main Halloweenies online slot game, and your winnings from the Free Spin games will be included to your win total. If you manage to get 3 or more Pumpkin scatter symbols (found anywhere on the 5 reels), you will trigger the Pick a Pumpkin Bonus Feature game. In the Pick a Pumpkin Bonus Feature game, 13 pumpkins will be presented to you. Contained in each pumpkin is a random amount as your bonus prize. The number of Pumpkin symbols that activated the Pick a Pumpkin Bonus Feature game determines how many pumpkins you are allowed to pick out. If 3 Pumpkin symbols activated the Pick a Pumpkin Bonus Feature game, you can pick 3 Pumpkins. If 4, you can pick 4 Pumpkins. If 5, then you can pick 5 Pumpkins. Please take note that since the Pumpkin is a scatter symbol, your winnings are calculated by multiplying the Pumpkin scatter symbols combination payout (refer to payout table) by the total number of coins you’ve bet. Also, the amount of coins bet per pay line already multiplies the random bonus prize amounts shown in the Pumpkin Bonus Feature game, and the number of pay lines enabled. You can win up to 5,300 coins in the Pick a Pumpkin Bonus Feature game. When the Pick a Pumpkin Bonus Feature game is over, you will be then taken back to the main Halloweenies online slot game, and your winnings from the bonus game will be included to your win total. Halloweenies has 5 reels where you may bet on 20 pay lines. The minimum bet is 0.01 and the maximum bet is 0.50 per pay line. You can wager 1 up to 5 coins per pay line bet. Therefore, the maximum bet amount is 50.00 per spin. Please take note that the amounts mentioned are in Pounds, but they will remain the same if you choose to play in US dollars, Euros, or Canadian dollars. Also, for every coin that you wager, you will enable another pay line. You will be paid out for winning combinations on enabled pay lines only. Since the Halloweenies online slot game is coin-based, your credits will be converted to coins when you play this game. The amount of coins you will have is dependent upon the coin size you choose in the Halloweenies online slot game. The maximum payout in the regular Halloweenies online video slot game is 13,000 coins per line bet. People who regularly play online casino games naturally love to stay longer on online slot games that have an Autoplay function. Good thing that Halloweenies is furnished with this function! In Microgaming online slot games, they have 2 game modes – Regular mode and Expert mode. You can have the game spin automatically for you with the Autoplay function that can be found by clicking the Expert button (located at the lower left portion of the game screen). After customizing the Autoplay function to your preferences, just click on the Start button, and the game will automatically spin for you while you just sit back, relax, and enjoy playing this happy Halloween-themed online video slot game!